If you need to find the exact location and depth of the drains at your property, then you need to find yourself a local drainage company that specialises in sonar drain tracing. A cctv drain survey will give you a lot of information about your drainage system (drain condition, pipe size, invert levels, type of pipe etc), but not the exact location and depth. Our specialist drain tracing services can reveal the exact location and depth of your drains. Call 0800 357 9371 or email info@draindetectives.co.uk for a FREE quote. Why might you need sonar drain tracing services? If you are close to a public sewer, you will need drain tracing to locate the drains for your build over agreement. A cctv survey may tell you that there is a buried manhole, but drain tracing can show the exact location of the manhole. Excavating is labour intensive and not cheap. Drain tracing takes the guesswork out of exactly where you dig. Do I need drain tracing for a build over agreement? If you're planning to improve your home by adding an extension, conservatory, annexe or garage, you'll need to know if there's drainage on your land, and if so where it is. If you're building within three metres of a public sewer, or within one metre of a public lateral drain, you'll need the approval of your local authority before work begins. Your water authority will be able to provide a map of local sewers. However, this may not be up to date or accurate. It is down to you to show the exact locations of your drains. 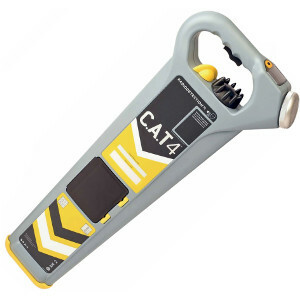 Our experienced drain engineers use the latest equipment to carry out our sonar drain tracing. Call 0800 357 9371 or email info@draindetectives.co.uk for a FREE quote. How does drain tracing work? 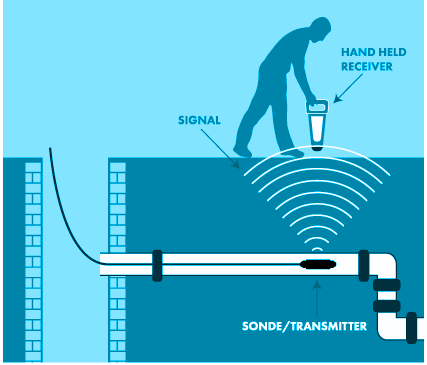 A sonde or transmitter is attached to the head of a cctv drain camera or crawler camera (in larger pipes) and placed in the drain, pipe or sewer and sent in the direction required. The transmitter sends a sonar pulse out and the engineer follows it above ground using a receiver. The pulse signal is sent out from the sonde in a circular or arch configuration. The drainage engineer adjusts the receiver so that he has a minimal signal. At this point, they will be directly over the top of the transmitter or sonde. The receiver will give the exact location and equally important the depth of the drain. For FREE advice about sonar drain tracing, call 0800 357 9371 or email our office. Why should you use Drain Detectives to do your drain tracing? Not sure where to start? Call our friendly office and an experienced engineer will advise you on the best way to trace drains on your property. Whether you are locating a buried manhole in a small terraced house or about to build a large extension in the garden your home, we can help. We are proud to be members of checkatrade. We ask all of our customers to leave reviews after we have completed drain tracing. What areas of South East England can we carry out sonar drain tracing? Our drainage engineers can carry out small and large scale sonar drain tracing across the South East of England including Kent, Surrey, London and Sussex, from Canterbury across to Bromley, Croydon over to Walton-on-Thames and Wandsworth down to Burgess Hill. If your home or commercial property needs sonar drain tracing, you have come to the right place. Call our friendly office on 0800 357 9371 today for expert advice and a FREE no-obligation quote!